Before Tania fulfilled her dream of becoming a veterinarian, she worked for many years as a Registered Nurse in a busy vascular surgical unit in Brisbane. However the calling towards animal health and medicine was always in the back of her mind and before she knew it she was graduating with honours from the University of Queensland in 2011 with a degree in Veterinary Science. 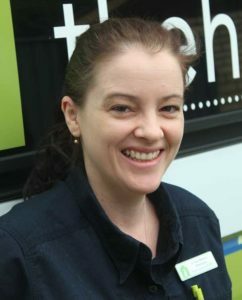 After graduating, Tania spent 18-months working in a regional, small animal 24hr clinic in the UK before heading home to work in Brisbane and finally joining The House Call Vet team in 2016 after the birth of her daughter Lucinda in 2015. Tania loves all animals, but has a special soft spot for companion birds, particularly nutrition, mental health and improving general quality of life as well as pocket pets (rats, mice, guinea pigs). Tania has two feline fur babies (Han Solo and Darth Vader!) and loves spending her free time in the snow snowboarding with her husband.